The floors, ground and first, are now either fully fitted with Finnish pine or have ply fitted awaiting tiles, and the house has taken on a completely different feel, a sort of light at the end of the tunnel moment! Needless to say the tile choices have still to be finalised! Most of the sanitaryware has arrived and my 'special' bath is scheduled for next Tuesday, so I'm hoping to be there when it is delivered, so that I can take the first photographs! On Friday, Lee and Perry the kitchen fitters, came out to do what's called a pre-installation check. As expected the kitchen and utility passed with flying colours and all being well installation will begin week commencing 17 September. The week ended with all the pine floors being sealed and finished with a mid-sheen clear varnish. They look wonderful and almost too nice to walk on! As expected the strict 'no shoes' rule applies! 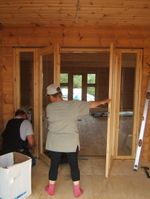 This week the framing, trimming and cladding to the interior of the bay windows was completed. The pine cladding reaches right up to the underside of the apex of the roof structure and gives added height and spaciousness to the room. A pair of fully glazed doors and sidelights have been installed inside the entrance lobby, separating it from the open-plan living space beyond. Floor laying will commence again next week to both first floors and the vertical flue is also due to be fitted, ahead of the installation of the log-burning stove. The plumbers are due back next week and will oversee the delivery onsite of the sanitaryware. The kitchen fitters are due at the end of next week to have a site meeting and pre-installation check. And the floor finishers are also due at the end of the week to seal and protect the floors. And me? I'm still hard at work on tile selection!!! Hi, another busy week for all! More painting to the exterior and the 'boat house' now matches the main house! Inside, the floor laying has begun and by the end of the week all of the ground floor is finished. The lobby, kitchen, utility, cloakroom and downstairs ensuite have had ply laid as they will have tiles laid here (when I've choosen them!) and everywhere else now has beautiful Finnish pine, expertly laid by Upi and Markku. 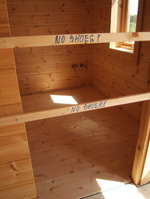 Oh and the house is now officially a 'no shoes' zone, socks or slippers only please!